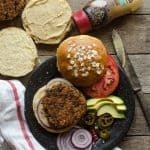 Sweet, bold, and zesty Sweet Potato and Black Bean Burgers are my favorite veggie burgers around. Today, I’m working with Sabra to introduce a brand new product they have just launched, and I’m super excited about it. Sabra Spreads are the new hummus-based sandwich and burger spread that are going to kick mayo to the curb. With tons of flavor and 75% less fat than their mayo counterpart, there’s so much to love. These spreads come in three different flavors, can be found in the refrigerated deli section at your grocery store, and are perfect for all things sandwich! Keep your eyes peeled, because #SabraSpreads are new and are going to quickly become a sandwich staple in your home. I’ve been putting Honey Mustard spread on everything from cheese sandwiches to chicken burgers – it’s so good, especially if you are already a honey mustard fan. Sea Salt and Cracked Pepper is excellent on veggie wraps, and I’ve been using it in place of mayo in egg salad (it’s amazing). I’ve been putting Sabra Garlic Herb Spread on all my traditional lunch meat sandwiches, and I even spread a little in my grilled cheese sandwich before cooking. I highly recommend you try that one too. I decided I wanted to make a veggie burger for you today. I think veggie burgers have a weird connotation with some people. When I make a veggie burger I’m not trying to replace meat, I’m simple making another kind of burger that I love to eat. 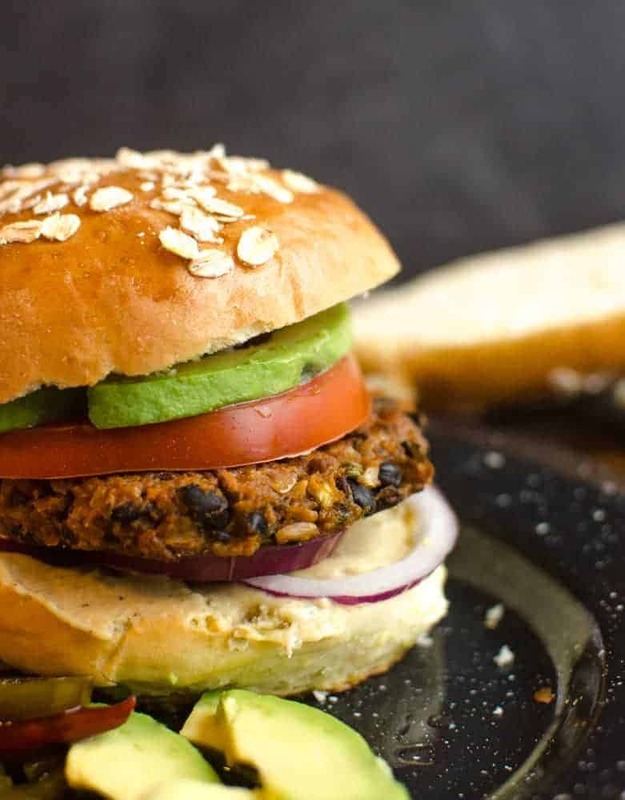 Sweet Potato Black Bean burgers are one of my favorite veggie burgers because they have so many of the smoky rich flavors that I love in tacos. I’m always up for a burger that tastes like tacos. The sweet and savory combo is one of my very favorites (remember these Sweet Potato and Black Bean enchiladas? So good!). Sweet, bold, and zesty Sweet Potato and Black Bean Burgers are my favorite veggie burger around. Preheat your oven to 375 degrees and grease a baking sheet well. In a small bowl, mix 1 cup of cooked sweet potato and the black beans. Use a potato masher or the back of a fork to lightly mash the potato and beans together. You’ll want to mash it enough to break up some of the beans but a few larger pieces of bean is fine. Add 1 cup of rice, the onions, and the spices to the bowl, and stir to combine. The mixture should come together in a soft and moderately sticky dough. If the mixture is not coming together, continue to add rice, stirring well after each addition, until the mixture starts to stick together when stirred. Scoop the mixture into a 1/4 cup measuring cup and then place it in your hand (you might want to line the measuring cup with a piece of waxed or parchment paper). Press the mixture into a patty that is about 1/2 inch thick and place it on a well-greased baking sheet. Repeat with the rest of the sweet potato mixture. Bake for 35-45 minutes, flipping the patties over at the 20 minute mark. The patties should be cooked well and dry on the outside, but they will still be soft in the middle. If you like them less dry and more firm, cook them the full time. If you like them soft, cook them less. I cooked mine for 40 minutes. Serve the patties on buns with a Sabra Spread, sweet and spicy jalapeños, tomato, red onion, and avocado on top. Or you can serve them without the bun and wrapped in lettuce instead. You can use sweet potato that you have already cooked. If you need to cook some just for this recipe, here’s what I like to do: slice a sweet potato length wise, drizzle all sides with olive oil, place cut sides down on and baking sheet, and roast at 400 degrees until for tender (about 15-20 minute). When the potato is cool enough to handle you can just scoop the flesh out of the skin. Roasting the potatoes gives them the best flavor and texture for making veggie burger in my opinion. Have you tried smoked paprika yet? It’s pretty new to my kitchen but I’m loving it lately. It’s adds just the right amount of smokiness and it’s delicious. I’ve started adding it to everything, from these sweet potato and black bean burgers to taco soup and taco meat to enchilada sauce. I picked some up from the other day (you can order that same kind here) and it was a great price. I’m really excited to start using it more. 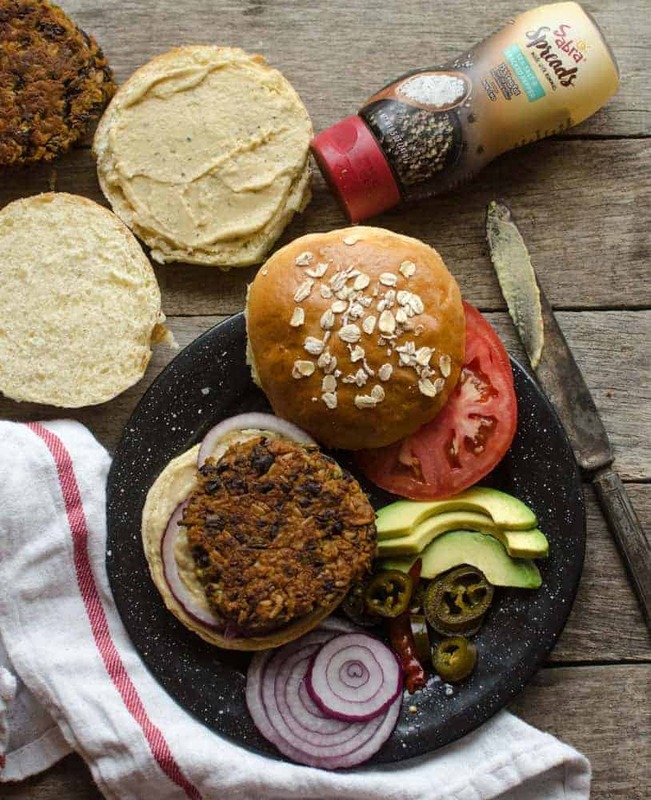 I liked the idea of using the Sabra Spreads on a veggie burger because it just feels healthy. You’re already rocking it with a veggie burger, so why not top it with all the good things? The spreads also happen to be gluten-free, vegan, dairy-free, and kosher. The patties are meatless, gluten-free, vegan, and they pack tons of flavor. You can serve them up like a traditional burger (I made my whole wheat honey burger buns to go with them), throw them on a lettuce bun, or eat them over greens like a taco salad. All are great options for these. 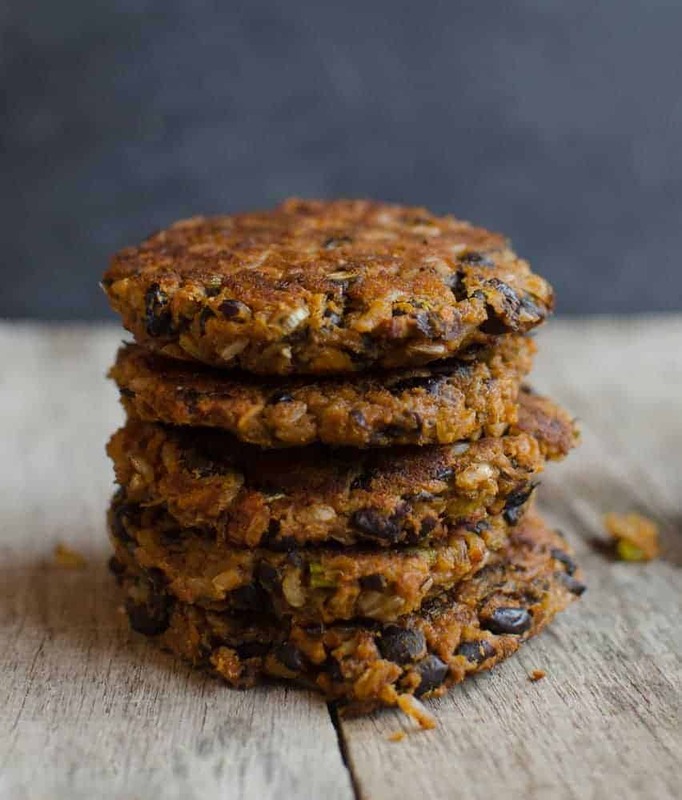 These sweet potato and black bean burgers can be made ahead of time, and they also store well. You can whip up a batch on your food prep day and keep them in the fridge all week long. You can also keep them in the freezer for much longer. It’s also nice that you don’t have to fire up the grill to make these. As the weather turns cold, I’m not always ready to give up my burgers, even though I’m getting less excited to fire up the grill. I really like that these can be made in the oven and still crisp up really nicely. See? So much to love. 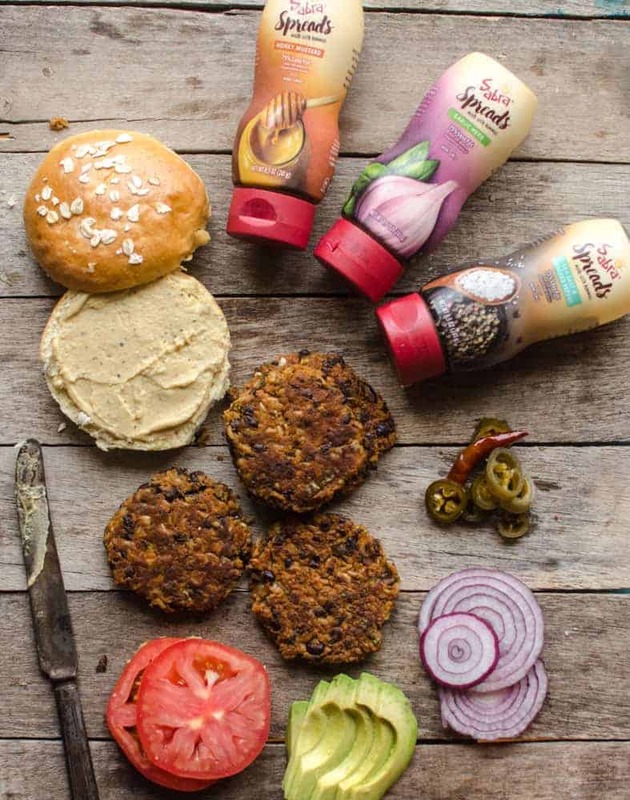 I can’t wait for you to try these burgers and those new Sabra Spreads. Whether you are putting them in egg salad, in a wrap, on a burger, or in a perfectly simple ham sandwich, you won’t be disappointed. Heck, when they first came I squirted them on my finger just to taste them and wasn’t even sad about it. So tasty! Enjoy Sabra’s new product and this lovely, hearty, flavor-packed sandwich, from my kitchen to yours. Disclosure: This post is in partnership with Sabra, but my opinions are my own. Thank you for supporting the brands that continue to make Bless this Mess possible.